Are you looking for the Best LMS Software to improve the overall competitiveness of your company? There is no surprise in why this software is becoming the new corporate secret in improving the business performance. Establishments in the education field bring the largest field of learning management system software for users. With the advancement of the Internet, these educational institutions pick the fact that when the courses and resources are brought online will allow them better engaging with the students and it improves the teaching processes also. The best learning software allows the students to access their assignments and grades from any anywhere. This streamlined path for connecting with the teachers helps to solve questions easily and get feedback. Learning management system software is cloud-based software. It unifies classroom, virtual, mobile and e-commerce competences into a single and secure platform to meet any training needs of the organization. Many organizations are trying to catch up with the fact that it makes easier for assigning self-paced and on-demand training of employees than getting all in a conference room. A lot of companies are coming with learning software programs; it can be a bit confusing for you to choose a one. You have to choose one of the top LMS software which comes with all the features that you are looking for. 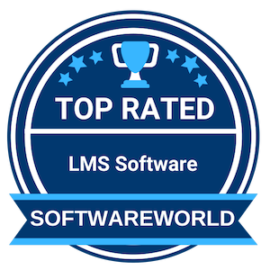 Below, we bring to you the best LMS software programs of 2019. What are the Best Learning Management System (LMS) Software in 2019? About Moodle: Moodle is a free online learning management system, providing educators around the world with an open source solution for e-learning that is scalable, customisable and secure with the largest selection of activities available. Moodle is supported by an active network of certified Moodle Partners to assist with integration and an active community of developers, users and supporters. Moodle is currently used in more than 230 countries with more than 70 million users worldwide. “Moodle is a web platform that allows cooperative learning, because it facilitates distance communication between teacher-student through forums, mail and chat. In addition, this platform offers various ways to include various learning methods ranging from text and video readings to crosswords.” – Yaruby M.
About CANVAS LMS : Canvas LMS isn’t just a product. It’s a rapidly growing company with an industry-pushing platform, hundreds of talented employees, & millions of passionate students and teachers. We can’t put more hours in your day, but we can help you waste fewer of them wrestling with your LMS. Canvas adapts to both how you prefer to work & the tools you work with. It provides easy-to-use, complementary tools that make course management a breeze. “I have used canvas at both my previous college and my current one which I transferred to, for both classes which were taken entirely on the platform (online classes) and classes where it was used as an aid. The ability to see an up to date schedule for your classes, contact instructors, revisit old modules are awesome!” – Joshua C.
About TalentLMS : TalentLMS is a super-easy, cloud LMS to train your employees, partners and customers. It is fully customizable to your own needs, with simple and comprehensible analytics about everything that happens inside your elearning environment. It offers strong support for SCORM & TinCan (xAPI), notifications, course selling, video-conferencing, gamification, extensible user profiles and more features than you can imagine. About Litmos LMS : Litmos is an online training platform that makes the management and delivery of web & mobile training courses easy. Our platform is fully extensible with our powerful API and out-of-the-box connectors. Litmos is one of the fastest growing learning technology providers in the world, supporting millions of users, in 130 countries in over 24 languages. We pride ourselves on our customer centric approach and continual innovation in the marketplace. It is our mission to enable training to be deployed in minutes not months by any organization. “The simplicity and usability of the learner view makes it easy for them to know what courses to do and what needs completing. Building courses is easy as well and they offer quite a few module course types in addition to that recently there are a lot of great features to automate the the reminders to ensure learners are completing tasks on time.” – Artem V.
About Lessonly : Lessonly is powerfully simple training software that helps teams learn, practice, and do better work. We enable busy teams to get on the same page, stay ahead of change, and deliver amazing experiences to customers and prospects. Lessonly is powerfully simple learning management software that helps teams learn, practice and do better work. We are used by 1.8 million learners at more than 600 leading companies including Trunk Club, Ibotta, U.S. Cellular, and Zendesk to share knowledge and reinforce best practices. “For the course of educational training, the tool is very usefulness and allows to share videos and projections of images dynamically. Really Excellent tool of training.” – Romay zuleima f.
About Easy LMS : Founded in 2013, Easy LMS is a user-friendly, intuitive and easy-to-distribute Learning Management System and a one of a kind solution for organizations. We provide a competitive Quiz solution, formal Exam solution, informative Course solution and an engaging Assessment solution with certification. All of this for very competitive pricing! With our easy-to-use tool you can engage, train and certify your employees or students! With offices in Brazil and The Netherlands we provide excellent support for 12 hours a day! Our solution is not tied to any specific organization size, our service is used globally by SMEs and international corporations too! “My experience so far has been great, I love using the system, it’s helped a lot in my business already and I’m excited to continue to see the benefits of producing training programs that can help my team duplicate their work in a error free manner. You should use Easy LMS.” – Joshua S.
About Teachable : Teachable is a powerful, easy-to-use online course creation platform. Since our founding, we’ve been on a mission to make education accessible, engaging, and profitable. Today, over 7,500 creators (and counting) are building courses powered by Teachable. We give our course creators everything needed to create, market, and sell their course online, with little to no technical knowledge required. Our platform allows perks from unlimited courses and unlimited students to site customization and personal branding. “My favourite thing about Teachable is it ‘just works’ out of the box. Most of its functionality is intuitive and it doesn’t try to add a million features that most people won’t use. It’s a software tool that knows what it is and who it’s for. It makes it very easy to make a good looking site and get a course up for sale.” – Steve P.
About LearningStone : LearningStone provides a blended learning and collaboration environment for training professionals. With its easy-to-use block system and many other powerful functions, you’ll be able to organize your participants and start communicating in no time. LearningStone is cloud based and ready to use! LearningStone is used all over the world in agencies, companies, and institutions by training professionals who need to support instructor-led training with an excellent digital platform. “It is very cheap, and its interface and use is very easy and friendly. You can connect with more than 700 participants. It helps you a lot in the company and the efficiency. I like this platform very much.” – Maryuly O. About NEO LMS : NEO is a simple, powerful, cloud-hosted LMS for use by individual teachers, schools, districts, and universities. It is a freemium product, with a rich set of features in its free plan and additional “power”? features in its low-cost premium plans. NEO is a great solution for schools who want to upgrade from older technologies and adopt a no-compromise premium LMS. The NEO interface is a modern, responsive design that looks sharp and automatically adjusts based on the type of device. It provides attractive tile-based dashboards for students, teachers and administrators, a graphical class catalog, as well as simple pop-out navigation. “NEO LMS is very easy navigate. Lessons can easily be done even without the users guide or manual. I really like the customer support because of its efficient and quick response. In terms of grading assessments, I find it easy with the use of its Rubric feature. Blended Learning Made Easy!” – Alphie G.
About EduBrite : EduBrite is a privately held technology start-up located in the Silicon Valley, California. It provides a SaaS-based online learning platform that enables businesses and training institutes to deliver end-to-end training solutions to their employees, partners and customers. The platform allows users to create courses, quizzes and surveys by using simple to use online editor or by importing any existing documents, presentations and videos and publish it on web and mobile. The system tracks all learning activities and provides dynamic reporting. “It complemented organization’s training efforts to reach out large number of employees in shortest possible time in a very simple way. Also in testing and administering of learning capabilities of employees through the reporting feature of LMS. Video tutorials are great help.” – Gaurav W.
About Trainual : Trainual is the training manual for modern businesses. It’s a simple and intuitive training and process management tool that makes it easy for growing teams to get everyone up to speed and on the same page, fast. The app was built to help business owners, team leaders, hiring and training managers centralize knowledge, organize processes and SOPs, automate training, and create learning systems for building more scalable or sellable businesses. About WizIQ : Founded in 2007, WizIQ is one of the world’s largest cloud-based education platforms. Over 400,000 educators have leveraged WizIQ to deliver learning services to 4 million+ learners across 200 countries. WizIQ is an easy way to teach and train online. It’s a cloud-based learning delivery platform with a suite of integrated features like virtual classroom, course builder, tests and assessments creation, reports and analytics, eCommerce and mobile learning. WizIQ empowers instructors, education service providers and corporates to deliver and manage live and self-paced learning with easy-to-use, scalable and cost-effective technology. “Wiziq is very much easy to use, it has a big learning curve but the continuous support from the team ensures you learn all the techniques involved with this. You can create multiple course works, create them in sub folders which feature we use for classes. They can be moderated time to time and still be shared with students too.” – Arshard A. » Online Training Software - Online training is one of the great paths to increased sales and enhanced productivity for employees as well as employers. Companies have shifted from on-site training to online training with the rise of technology. » Webinar Software - Visual communication has made it easier for people to communicate. There's something about visual communication which attracts people to pay more attention. Webinars use visual communication to portray classroom feeling and are the internet's method of bringing making people more attentive. » Meeting Software - Do you know about the best Meeting software of 2018? While no one denies that face to face meeting has its own benefits but sometimes it cannot be practical. And one thing all should remember is excellent communication is the key to the long-time survival of all business. » Online Conference Software - Video conferencing software is a necessary tool for business organizations. It helps in making remote work possible. Companies having multiple offices rely on video conferencing software to schedule and hold meetings.